Van Morrison’s song was the inspiration of the piece. 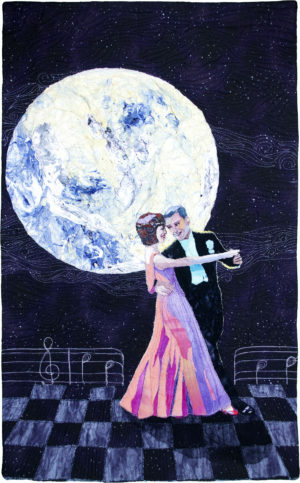 The intention was to capture the mood of the figure male cheerfully enticing his partner to dance him in the moon light. Just like the first two lines in the lyrics of the song. Fabric collage,painted heated Tyvek for textural parts of the moon, light thread sketch, applique, beaded and quilted. Tyvek, fabric & paints, acrylic medium, cotton fabrics, beads, wool/poly batting, polyester threads.